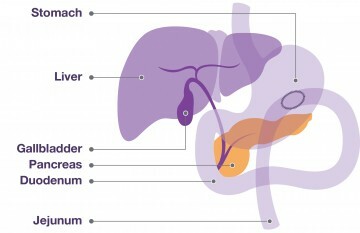 At some stage, about 1 in 5 patients with pancreatic cancer find that their tumour begins to compress the duodenum (the part of the intestine immediately beyond the stomach). This often comes on gradually and presents with discomfort after eating, which is often relieved by vomiting. Fluids may be easier to eat than solids. The stomach will gradually stretch until vomiting only happens once every few days. Weight loss is common, as food can’t reach the part of the intestine where it is absorbed. You will have a general anaesthetic and your surgeon may use keyhole surgery (laparoscopy) or make a small cut in your stomach called a mini-laparotomy. In order to bypass the duodenum, he/she will then connect another piece of small intestine, called the jejunum, directly to the stomach. You may be cared for in a high dependency unit (HDU) before going back to the ward. Recovery from a gastro-jejunostomy is usually fairly quick. You will be able to start to eat solid foods. You should be able to go home 2-3 days after your operation, once you are able to eat and drink without problems.